Many owners of the smaller, wood frame houses in Georgtown often believe their house has a litany of prominent owners, politicians, and wealthy individuals - and they are usually wrong. Those houses were mostly occupied by government workers, food stall owners, domestics, and journeymen. So, I thought the case might be the same when I was asked to research the small house at 3522 P Street, NW. I headed to the Peabody Room at the Georgetown Library, where librarian extraordinaire Jerry McCoy informed me that it was once the home of Hollywood Actress and Oscar winner Myra Loy from 1950 to 1951. Now we had an interesting house history! The house at 3522 P Street, N.W. was constructed between 1821 and 1832 by George Mahoney, a bricklayer. Because building permits were not required in the District of Columbia until 1877, this estimated construction date is based on tax assessments and an early advertisement for sale of the property. 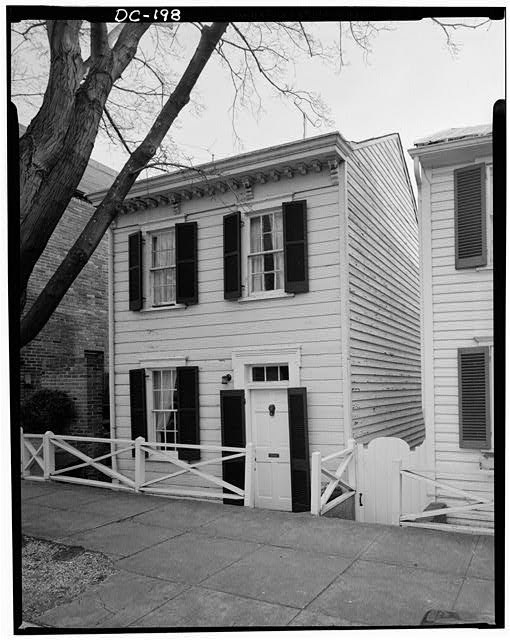 Mahoney acquired the site in 1821 from John Threlkeld, a prominent citizen of Georgetown. .
On March 22, 1943 the house was purchased by Roxana Doran for $,3500. At the time, the house was occupied by Florence Vinston, a widowed maid who was paying $20.50 per month rent. 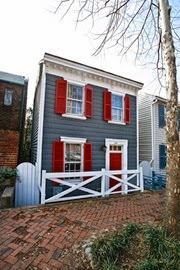 Doran, a real estate agent, renovated the house, as Americans began to express interest in their most historic neighborhoods following the opening of Williamsburg in Virginia. Ms. Doran’s most well-known tenant was actress Myrna Loy, who lived at 3522 P Street in 1951-52 with her husband, Howland H. Sargent. 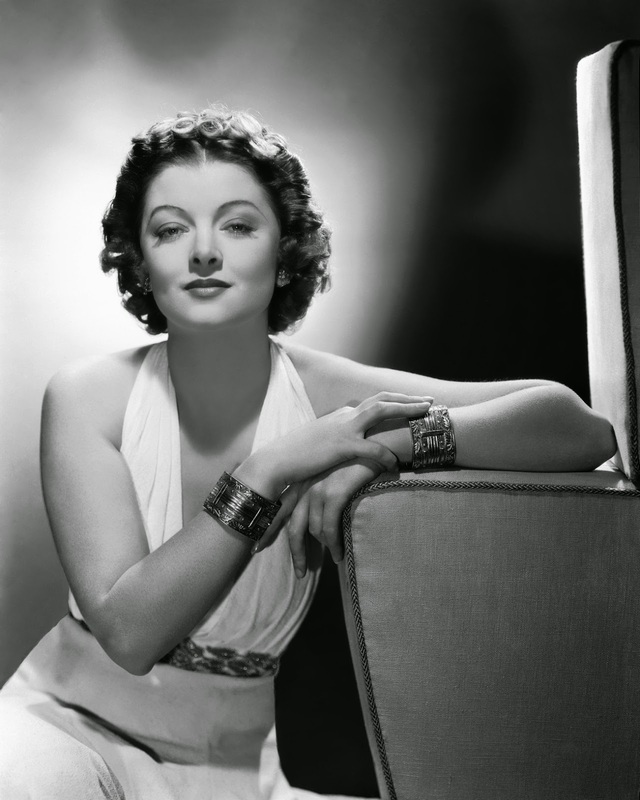 Myrna Loy was born Myrna Williams in Radersburg, Montana in 1905. When she was 13 her father died and her family moved to Los Angeles, where she spent the remainder of her childhood. She began acting in local stage productions when she was 15, and played her first film roles when she was 20. She was one of the few stars to begin in silent films but successfully transition to sound. In silent films she played exotic, seductive women, but later in sound films she played more refined characters. She played mostly small roles until 1933, when she signed with MGM and got two substantial parts, one of which was playing Nora Charles in “The Thin Man”, the role for which she has been best known since. She played Nora in five more Thin Man films over the years. In 1936, she was named Queen of the Movies (Clark Gable was king) in a nationwide poll. In the 1940s and 1950s she continued acting, but parts were fewer and further between. Among them was a starring role in 1946 in “The Best Years of our Lives, which won seven Academy Awards, though none for Ms. Loy. She never win an Oscar for a performance, but she did receive an Honorary Academy Award in 1991. She died in New York two years later. Ms. Loy was the first Hollywood star to serve as a member of the U.S. National Commission for UNESCO in 1948, and later was Chair of the Hollywood Committee for UNESCO. She also was a film advisor for UNESCO. She met Howland Sargent, who was Deputy Assistant Secretary of State for Public Affairs, at a UNESCO meeting in Paris. They were married from 1951 to 1960 (the first of Ms. Loy’s four marriages). A July 1948 Evening Star article, headlined “Georgetown Taking Myrna Loy in Stride”, says that Ms. Loy drew crowds at first when she ventured out, but that she later became such a frequent sight on the Georgetown streets that she was hardly noticed. Martin’s Tavern boasted that she was a regular customer. 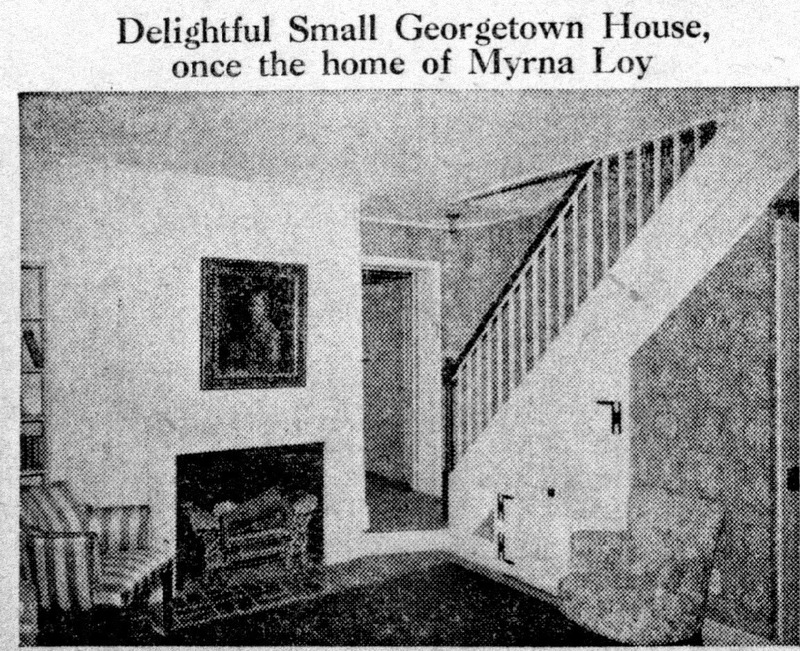 An item in the Washington Post on February 10, 1952 said that Ms. Loy and her husband finally had acquired a guest room, by moving to a new apartment on R Street that was part of the former “Friendship” estate. The article said that they would be moving from “their present ‘thimble of a house’ on P Street, which has only one bedroom.” The article does not say who the “thimble” characterization is a quote from – perhaps Ms. Loy? Copyright Paul K. Williams. Researched and written by Kenneth G. Peters and Paul K. Williams.